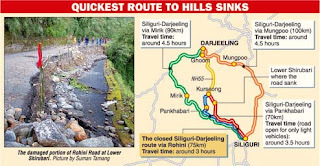 Rohini Road, the quickest route from Siliguri to Darjeeling, was shut today after a 7ft subsidence following heavy rain. The shutting down of Rohini Road means those travelling to and from Darjeeling now have the roads via Mungpoo and Mirik open for travel. Also, two-way small-vehicle movement has been allowed on Pankhabari Road from today after the Rohini Road was shut. Pankhabari otherwise can be taken only by light vehicles to come down from Darjeeling. This is not the tourist season, but those who travel from the plains to the hills for work frequently will be delayed on the way. The Mirik and Mungpoo roads, which merge with NH55 at Ghoom, take at least an hour longer. 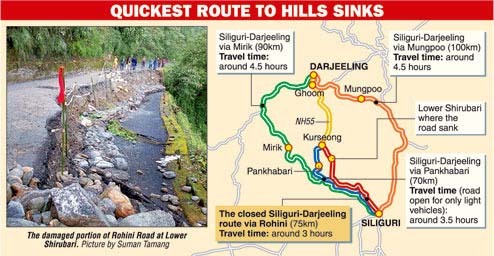 Rohini Road that snakes to Kurseong from the plains and then merges with NH55 or Hill Cart Road has subsided 7ft in a 50-metre stretch after heavy rain recently. As Rohini is the quickest route, it is also the most favoured. "The Rohini Road had to be closed as the road is sinking at Lower Shirubari. This was done in consultation with engineers who visited the spot. Traffic has been diverted through Pankhabari and some others routes. The GTA authorities are trying to restore the road as soon as possible," Anurag Srivastava, the district magistrate of Darjeeling, said today. According to GTA sources, this stretch got damaged last year, too, during the monsoon. "We had repaired the same stretch last year and this year again, it has subsided. We have visited the spot and felt that it is risky to let vehicles move through the stretch as the road has subsided here by around 7ft," an engineer of GTA said, on conditions of anonymity. "Repair has already started and we believe it would take around four days to complete it. Meanwhile, vehicles would move between the hills and plains through other routes. The road has started sinking since July 23. After incessant rainfall yesterday, it has further subsided in past 24 hours," he added. The Rohini Road, which connects Kurseong with Siliguri, is the most well-maintained road and is also the shortest route to Kurseong. There are three other alternative roads, including the Pankhabari Road, which connects the plains with the hills. "But the Pankhabari Road that also connects Kurseong with Garidhura in plains is steep and narrow. Only light vehicles can ply on this route," Pravin Lama, a driver, said. "The route to Darjeeling via Mungpoo is longer and it would take over five hours. Not to mention that the stretch along NH10 beyond Sevoke has a number of landslide-prone zones. During monsoon, the road often closes down because of landslides. It is a difficult drive through this route." The third route, via Mirik, which ends at Ghoom, has the problem of low visibility after dusk. "On this route, it is tough to drive in the evening and night hours, particularly in the stretch between Sukhiapokhri and Mirik. There is dense fog and the visibility is abysmally low," another driver said. "Unless the Rohini Road opens, we will have to take this route. As we will have to drive slower, it would take more time." A journey to Darjeeling from Siliguri via Rohini takes around three to three-and-a-half hours, depending on traffic congestion. But taking any of the other alternative routes, except Pankhabari, would take around five hours, said drivers. Sources in the GTA, when asked about traffic , said light vehicles would be diverted via Pankhabari whereas heavy vehicles would move via Mirik. The sinking of the Rohini Road has also left tour operators worried although there aren't many tourists in the hills right now.